In addition to typical core academic curriculum: reading, writing, math — students at London’s School 21 practice and excel at an often overlooked skill: public speaking. “Oracy” isn’t a word many kids or adults are even familiar with, but the London school puts a high premium on this “literacy of the spoken” word, contending that it helps kids learn how to read and write as well as how to find and cultivate their own voice. With a base of strong communication skills, kids at School 21 gain the ability to express themselves and to work through challenging and vital topics, including diversity and kindness. Through this art, they also learn how to listen respectfully to others and how learning from each other’s words can bring them closer as a school community. In an age rife with technology that’s rapidly replacing personal intercommunication, these students have the priceless opportunity to connect via the spoken word, using the power of eye contact that’s sadly now all too often reserved for looking down at a screen. Read on for how this innovative school is incorporating an essential and hands-on life skill into their curriculum. As soon as kids start at School 21, oracy becomes a part of their daily education with teachers encouraging students to politely and clearly express their thoughts and opinions, even when they are different from those around them. Instead of avoiding difficult topics and conversations, the teachers help equip the students with the ability to communicate with each other in respectful and open ways and even have an Oracy Toolkit to better facilitate the discussions. In addition to learning how to speak for themselves, kids also learn how to respect others and invite them into the conversation by asking questions. While these skills may seem like second nature, they are valuable for kids to learn from a young age and create the building blocks for discussions, sharing, and problem-solving in a welcoming environment. Kids also have the opportunity to take on “talk tasks” during which they discuss aloud what they have learned, an important practice because it emphasizes the lessons while also allowing them to work through the themes (including math work) in another way. Along with working on these skills in the classroom, the school also offers students the chance to practice their public speaking throughout the year in front of larger audiences. Public speaking often tops the list of things people fear the most in life, so getting kids comfortable expressing themselves from an early age is a huge service to their continued growth. As each child has the opportunity to speak and to listen, he or she understands the value in his or her own experience and view as well as others who might be different. The value of these exercises on social and emotional well-being cannot be overstated. The feeling of being heard and understood is that powerful and inclusive. As one young student said, “What makes me enjoy talking the most is that everybody’s listening to you, and you’re like part of the world and feel respected and important.” School 21’s Wellbeing curriculum as seen in the video above ties oracy into the larger picture of developing empathy and emotional awareness in your own words and in forming responses to others. 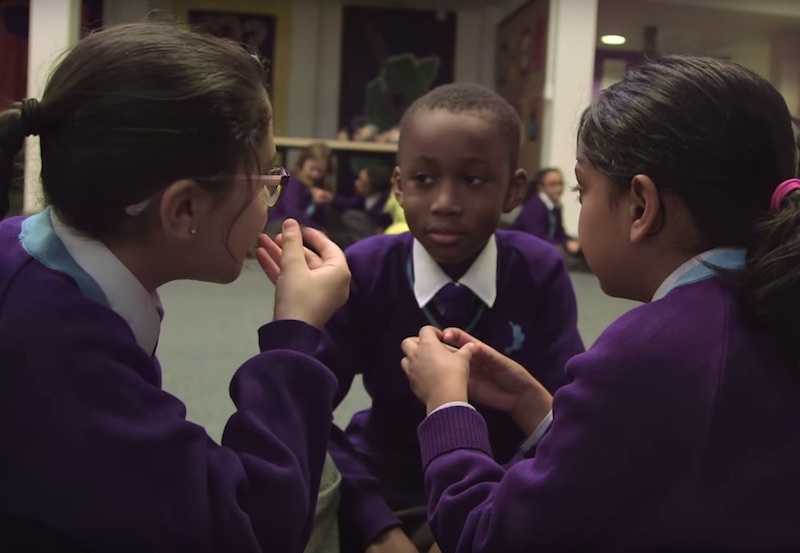 We wish every child and adult could take courses in School 21’s Oracy and Wellbeing — both of which are creating more eloquent, articulate, fair and just human beings. In addition to typical core academic curriculum: reading, writing, math -- students�at London's School 21 practice and excel at an often overlooked skill: public speaking. "Oracy" isn't a word many kids or adults are even familiar with, but the London school puts a high premium on this "literacy of the spoken" word, contending that it helps kids learn how to read and write as well as how to find and cultivate their own voice. With a base of strong communication skills, kids at School 21 gain the ability to express themselves and to work through challenging and vital topics, including diversity and kindness. Through this art, they also learn how to listen respectfully to others and how learning from each other's words can bring them closer as a school community. In an age rife with technology that's rapidly replacing personal intercommunication, these students have the priceless opportunity to connect via the spoken word, using the power of eye contact that's sadly now all too often reserved for looking down at a screen. Read on for how this innovative school is incorporating an essential and hands-on life skill into their curriculum.